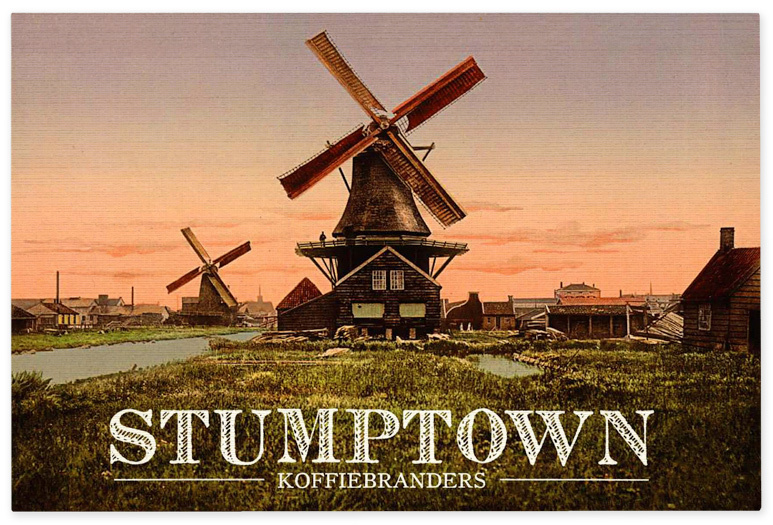 In this ongoing series about coffee branding, I’ve decided to begin with one of the best roasters in the US, Stumptown Coffee. Portland, Oregon based Stumptown was founded in 1999 by Duane Sorenson, who cares deeply about his coffee. The brand itself has been built on his passion for quality. No logo, aesthetic, packaging, or marketing can capture the word-of-mouth buzz that transcends the taste of their product. Packaging: There is no universal style to the Stumptown brand. Instead, an understated, but eclectic voice weaves itself through the various elements—beginning with their bags. For a company once credited with having the most valuable stock of coffee beans, you’d think more money would be spent dressing them. 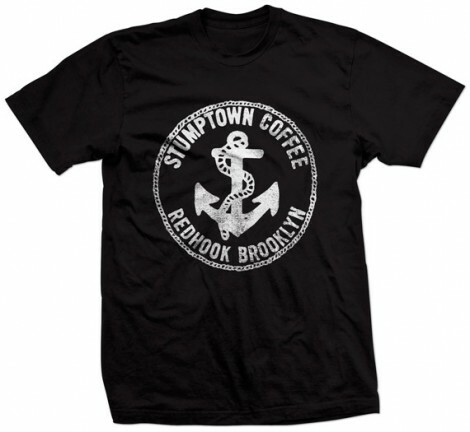 However, Stumptown choose a simple brown bag with a slight modification, a pocket. 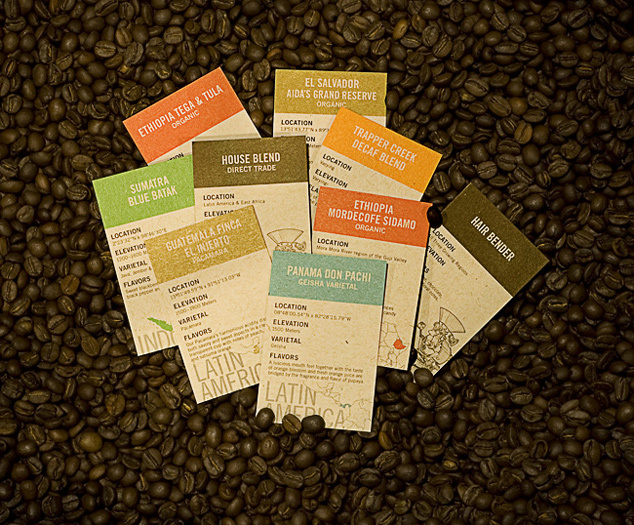 The slit in the front of the bag allows a color-coded card to be slipped in, displaying the type of bean, while the rest of the card contains information on the bean’s origin, elevation, and flavors. This modest, but functional packaging is a humble proclamation of the companies confidence in its product. One thing I really appreciate about Stumptown’s branding, is that they’ve avoided the largest cliché in coffee branding, what I call the “origin aesthetic.” Coffee only grows in countries within the “coffee belt” roughly bordered by the Tropic of Cancer and the Tropic of Capricorn, so every company selling coffee gets it from similar cultural regions. It’s difficult to “own” tribal patterns, native color palettes, or photos of the locals, when any of your competitors can do the same. It’s an overused and therefore meaningless way to tell your customers who you are—think bottled water and images of mountain springs. Company Responsibility: When companies do use origin images, it often seems like it’s only purpose is to exploit the perception of the local population to increase coffee sales, instead of genuinely helping them. Stumptown however, has gone above and beyond most in the industry to establish relationships and pay above fair trade prices for coffee. They also work intensively with farmers to improve the quality, and thus the value of their crop. 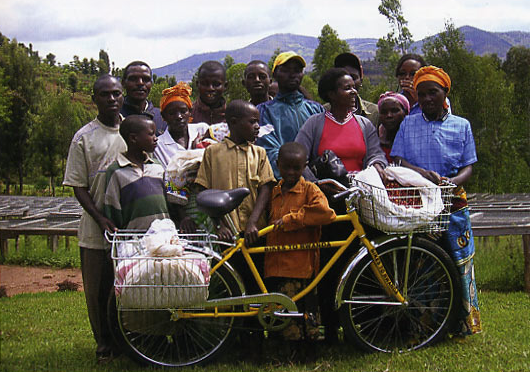 In 2006, Duane also helped create a non-profit organization in Rwanda that builds and maintains cargo bikes to help coffee farmers deliver their crop. Yet, they’ve chosen not to exploit any of this in their branding or marketing, they just do it because it’s right. Cafés: I’ve only been to a couple Stumptown cafés, but I found them both to have a similar ambiance, even though they were quite different. The atmosphere captures a slight steampunk vibe, with dark wood contrasting against the shine of La Marzocco espresso machines. 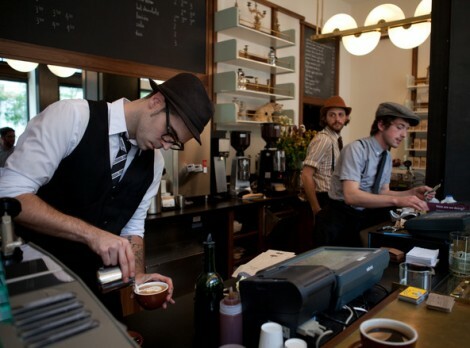 The barista’s were casually dressed like members of an indie band, except at the Ace Hotel in NYC where the baristas resemble the cast of the Newsies. 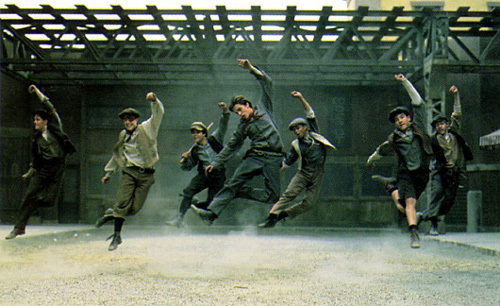 While the environment will quickly be dubbed “hipster” by some, I think the latter is a fun and sophisticated twist on a bygone era. 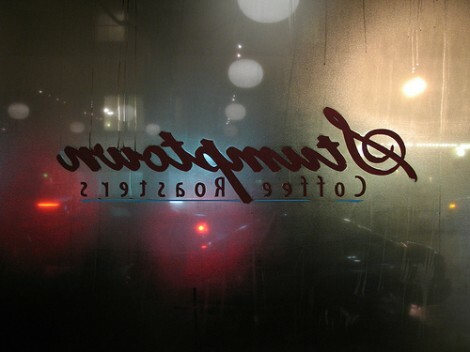 It makes visiting the café as much of an experience as drinking Stumptown coffee. If you want commodity comfort, look elsewhere. 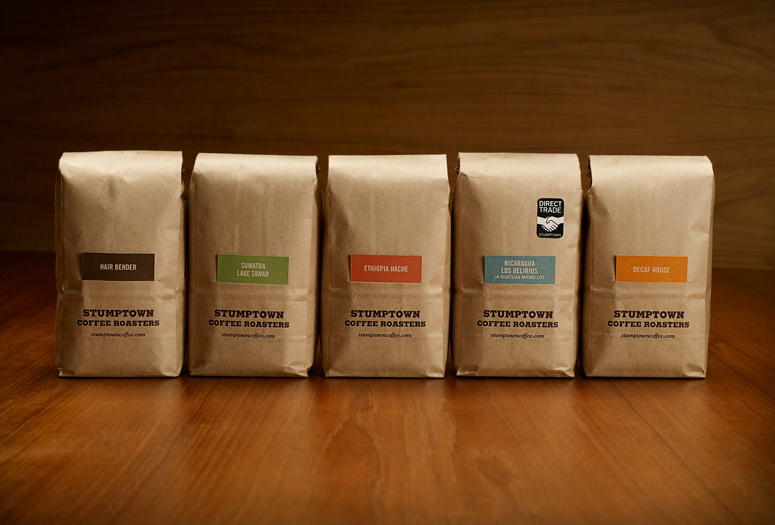 Collateral: What I find most successful about the Stumptown brand, is the freedom and flexability it has established. All of the collateral has a unique aesthetic, designed with the brand in mind, but not dependent on anything designed previously. 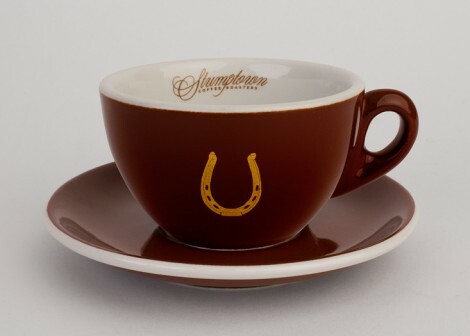 Each item is considered and fits comfortably into an invisible aura that Stumptown has created for itself. 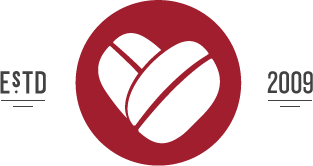 This characteristic has successfully allowed the brand to be placed within various lifestyles instead of trying to create one itself. 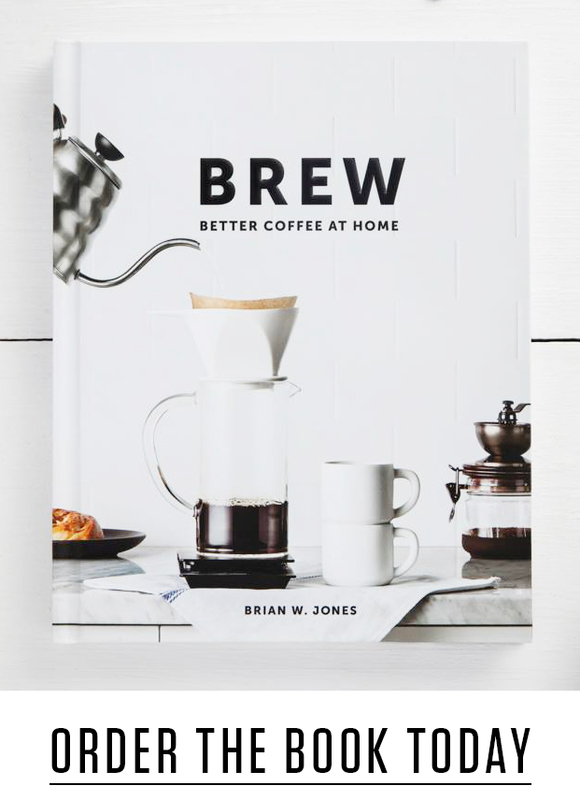 Coffee is a huge industry—the second largest commodity in the world after oil—and Stumptown is one company treating it differently. While I know there have been others in the past, most have let their concern for the quality in the cup slip. Stumptown meanwhile, has been a master of making that their greatest concern, which is more valuable than anything good branding can do. Design by Fritz Mesenbrink, now with OMFGCO.